Arrow Bank Holiday Park01544 388312work01544 388312fax Touring ParkArrow Bank offers a spacious, level touring area that is quietness personified – perfect for touring caravans, motorhomes, folding campers, trailer tents and camping where every pitch is a sunny one! (English weather rules apply!). We have 30 premier touring pitches, spacious grass camping pitches, self-catering lodges as well as riverside holiday home plots. 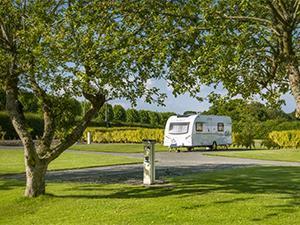 This 5 star standard holiday park offers a welcoming retreat to escape the hustle and bustle of everyday life. You will arrive to a warm welcome, we will show you to your touring pitch or self-catering accommodation and give you all the information you need to find your way around the park. Arrow Bank is ideal for exploring beautiful Herefordshire, the Marches towns, castles, black and white villages, hills and rivers in the county. The village is just a short level walk from the park. Visit the 13th Century church, the converted Dovecote shop, or pop in to the local inn for a home-cooked meal or a drink. Arrow Bank offers a spacious, level touring area that is quietness personified – perfect for touring caravans, motorhomes, folding campers, trailer tents and camping where every pitch is a sunny one! (English weather rules apply!). We have 30 premier touring pitches, spacious grass camping pitches, self-catering lodges as well as riverside holiday home plots. Disabled toilets, Night porter Children welcome from any age. Located on the east edge of Eardisland village, accessed by the B4360, travelling from Leominster.